Y’all know I’m all about the bowl meals, right? It’s pretty routine for me to just go into my fridge, grab whatever odds and ends I have, and throw them into a bowl for a meal. They usually have some sort of base (a grain or salad greens), a protein, some vegetables, and some sort of cheese or dressing on top. The rice-hummus combo is one of my favorite bowl meal bases, so I wanted to highlight that here and show just how flexible it is. 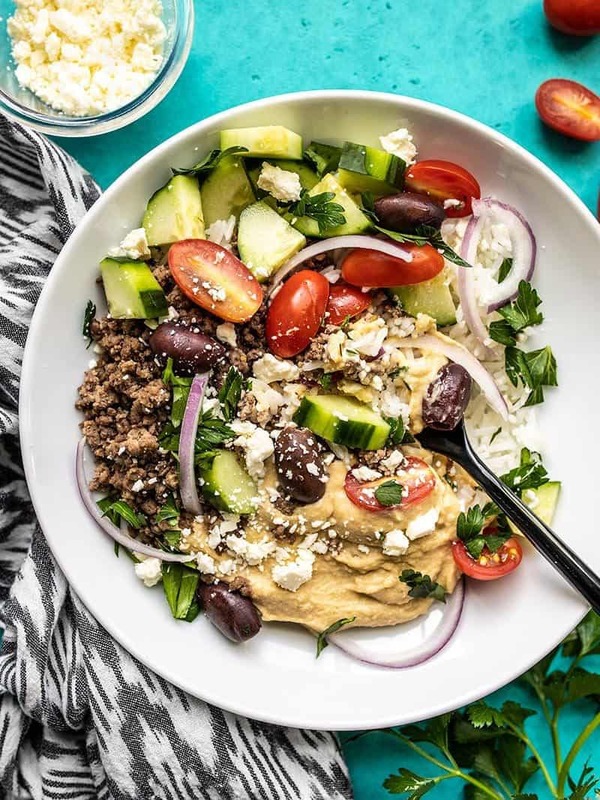 So, that being said, these Mediterranean Hummus Bowls are less of a “recipe” and more of a template for easy meals. I’m going to offer plenty of ideas for swaps and substitutions below, but I encourage you to get creative and discover your own new flavor combinations based on what you have in your fridge! Ground turkey or chicken instead of ground beef prepared in the same way as the beef in the recipe below. Go all veg! The hummus provides a good amount of protein, so you can keep it simple and just do the rice, hummus, and vegetables. Any other grain, like bulgur, farro, brown rice, quinoa, etc. Or you can even make this into a naan pizza. Spread the hummus over the naan like a sauce and add the rest of the ingredients on top. 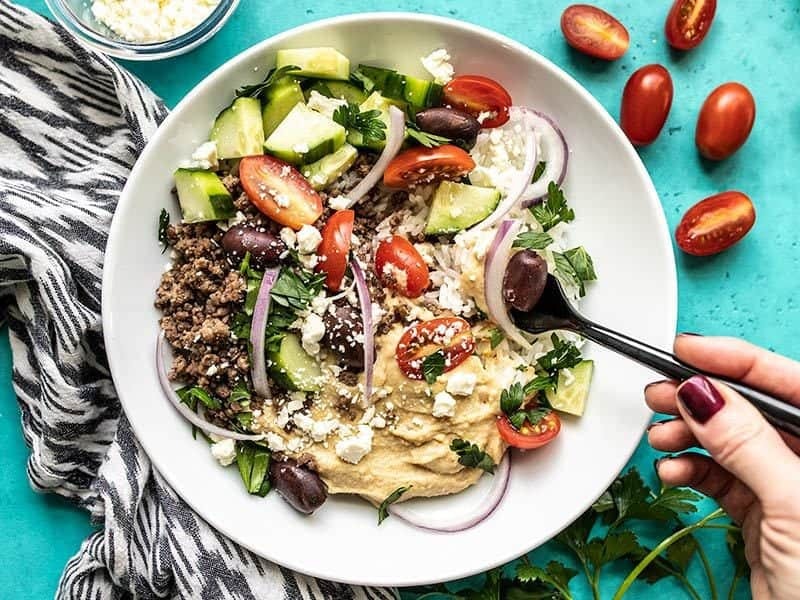 Just about any protein or vegetable can be added to these filling and tasty Mediterranean Hummus Bowls to make them your own and use up your leftovers! 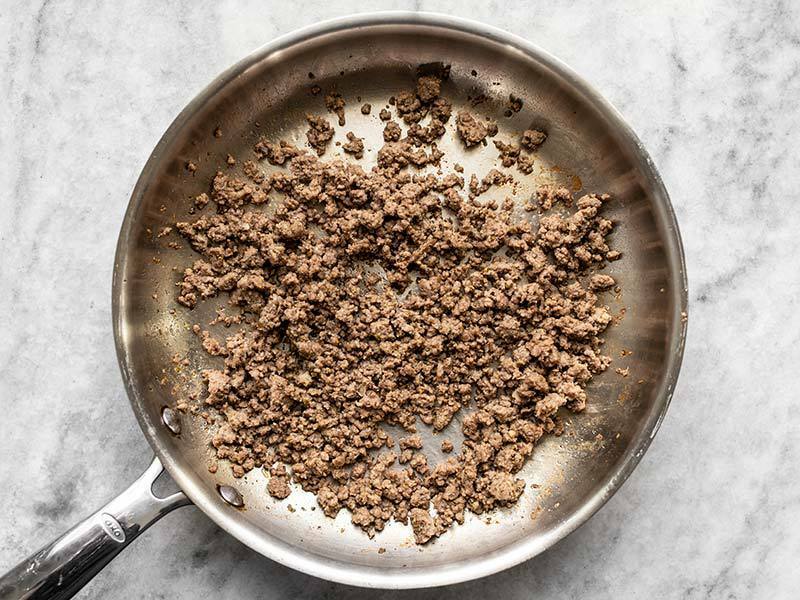 Add the ground beef to a skillet, along with the oregano, cumin, garlic powder, and salt. Cook and stir the beef over medium heat until fully browned and evenly combined with the spices. To build the bowls, add 1 cup rice and 1/4 cup hummus to each bowl. Divide the remaining ingredients among the four bowls, or in any amount that you desire. Enjoy immediately or refrigerate until ready to eat. This recipe works great for meal prep! I'd eat the meal prepped bowls cold rather than reheated to avoid cooking the raw vegetables. Add 1/2 lb. ground beef to a skillet along with 1/2 tsp dried oregano, 1/2 tsp cumin, 1/4 tsp garlic powder, and 1/4 tsp salt. Cook and stir the beef over medium heat until it is fully browned and combined with the spices. 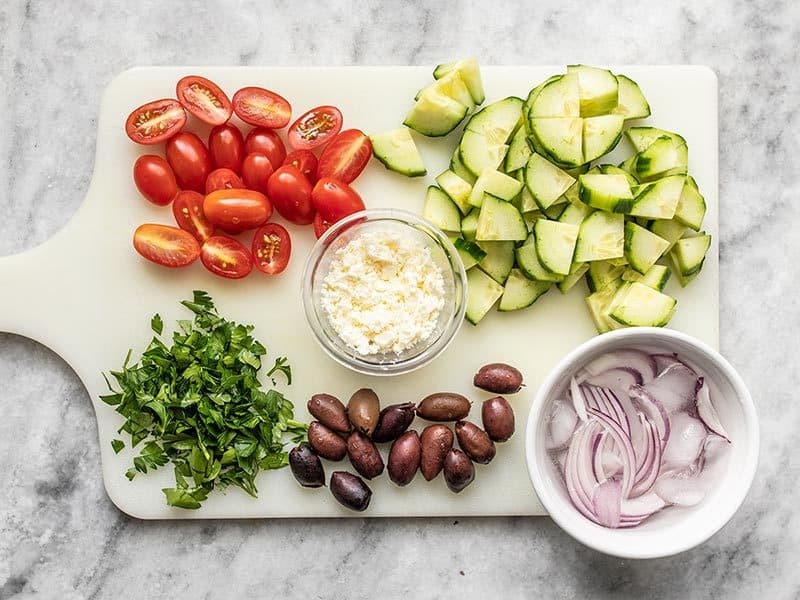 Then it’s time to build your Mediterranean Hummus Bowls! Start with about one cup of rice per bowl, add 1/4 cup hummus, then just go ahead and divide the rest of your ingredients among the four bowls. You can serve them right away, or pack them away in meal prep containers for later. They’ll keep in the fridge for about four days. Are you already a hummus bowl eater? What are your favorite topping combos? I’d love to hear more ideas! Leave your favorite ingredients for me in the comments below. Beth does it again! This was absolutely magnificent. I have to add this to my rotation of quick, easy, delicious and nutritious budgetbytes meals! Our local Arabic restaurant serves something similar for lunch. They start with a handful over greens then a scoop hummus, tahini, tabouli, 2 falafel and a scoop of a rice/lentil mix. It is so yummy so so with a bit of Arabic hot pepper sauce. Great recipe! Inexpensive, easy, and delicious. 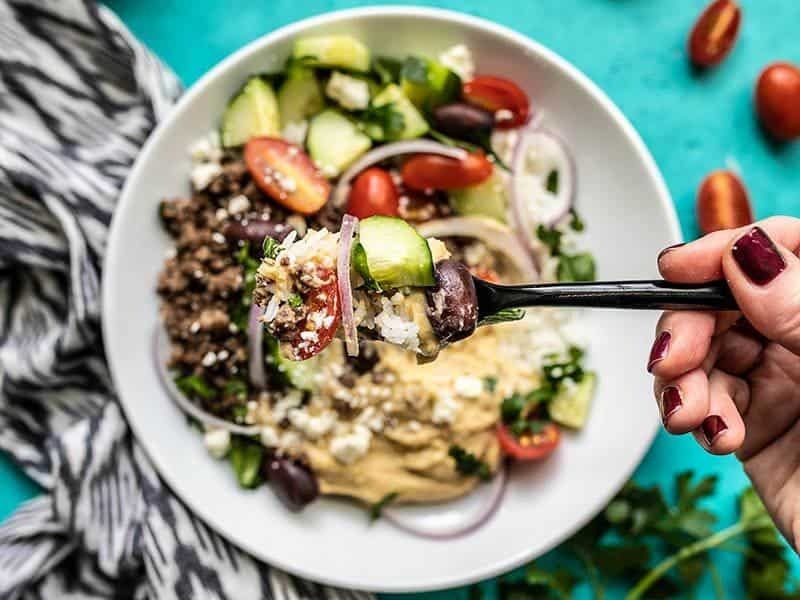 The ground beef is really flavorful and veggies give the dish a nice freshness while the hummus is the dressing that brings it all together. Thanks again Beth!